For payment by direct bank transfer, use�“Press Hawk” as refererence and email hippocrates.poetry@gmail.com with your request: the book title, number of copies and your postal address. 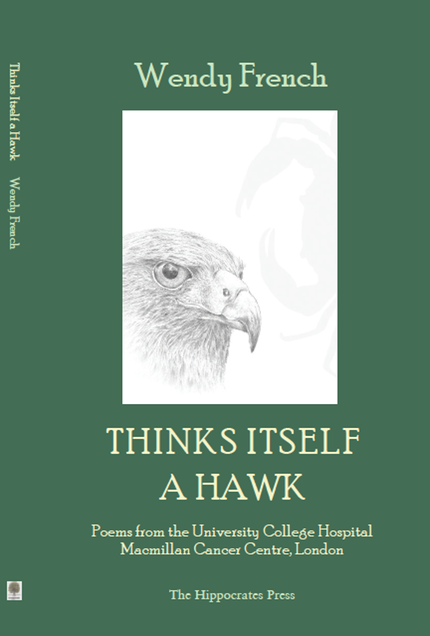 “…�Thinks itself A Hawk is a moving, candid, illuminating and necessary collection. We are drawn to look closely at illness and suffering, the poet never once shying from the awfulness of things. But there is gentleness too. Reading the book is like having French push open a door, beckon us, and with her arm around our shoulders, she tells us to look. And all the time we’re looking, French is there, watching with us. 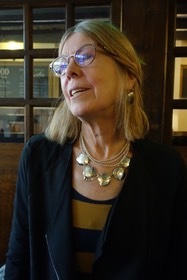 She is the poet, the observer, the chronicler and the guide…"
Wendy French’s meticulously observed and profoundly moving new collection grew out of a residency with the University College Hospital MacMillan Cancer Centre in London. Working with patients, sharing in their hopes and fears, tracking the everyday endeavours of a vital medical hub, Wendy French found herself drawn into lives in which blood tests,�diagnosis, chemotherapy and hope become as much part of the human experience as cappuccino and Vivaldi on the radio. One life, that of Zipora, a Jewish woman whose origins lay in the darkest days of the twentieth century, is chosen for particular attention for its power to place everyday experience in large frames, but also for the brightness with which it reminds us that everyday life is unique and important. Wendy French, co-author of the enterprising Born in the NHS,�brings all her gifts of compassion, precision, and feeling yet understated language, to the high task of accompanying the journey we call cancer. Wendy French�won the inaugural 2010 Hippocrates Poetry and Medicine prize for the NHS section in 2010 and was awarded second prize in 2011. She has two chapbooks and two collections of poetry published,�Splintering the Dark, Rockingham press 2005, and�surely you know this�(the title was taken from a Sappho fragment) Tall lighthouse press 2009. Her collaboration with Jane Kirwan resulted in the book�Born in the NHS�which was published 2013 by Hippocrates press. She has worked for the past twenty years with children and adults with mental health problems and was head of the Maudsley and Bethlem Hospital School. She left this post to concentrate on working with people with aphasia/dysphasia helping them to recover their use of language through poetry. She was Poet in Residence at the Macmillan Centre UCLH from April 2014-2015.